I’ve often mentioned that I like to combine recipes. This is the perfect example. We were invited to dinner at Andrew’s clients’ house – Charles and Salome. Salome somehow pulled off an awesome dinner after work on a Wednesday. One of her appetizers was a bed of arugula with sautéed mushrooms, toasted pine nuts, and some grated parmesan. Really tasty. I think Andrew almost licked the plate when it was finally all gone. Tonight I was looking through 200 Veggie Feasts, mentioned in the Pea, Potato, and Arugula Soup entry, and they had this really yummy looking Mixed Mushrooms on Toast. Kind of like Salome’s salad but without the pine nuts and on toasted sourdough bread. I decided I wanted to make it tonight but with the sautéed mushroom recipe I love from Lucy Waverman. Voila – 3 sources of inspiration coming together in 1 helluvanelegant dish. Here it is. Trim mushrooms, removing stalks if you are using shiitake, and chop. Heat oil in a skillet over high heat. Add garlic and mushroom and saute until beginning to lose their juices, about 3 to 5 minutes. Add balsamic, and stock and bring to boil. Reduce until liquid practically disappears and then add Port. Saute 1 minute longer, sprinkle with salt and pepper and parsley. Meanwhile toast chunky slices of baguette, then arrange on serving plates. Drizzle the toast with olive oil. 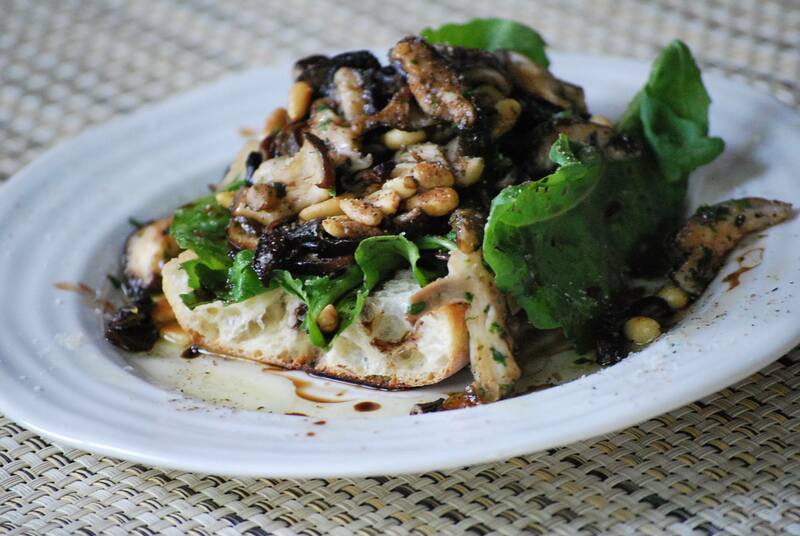 Top the toast with equal amounts of arugula leaves and mushrooms. Sprinkle with toasted pine nuts. Drizzle with a little more olive oil and balsamic vinegar, salt and pepper. Serve immediately.